1. 3 in 1 design: Qi charging stand, AppleWatch Charger stand and Airpods charger station. 2. The main body is made of aluminum alloy material--Beautiful and Durable. 3. Internal hidden charging line--No more problem of charging or placing your Airpods. 4. Wireless charging function and unique logo hole design can help you better manage your phone charging line-- Make things tidier. 5. 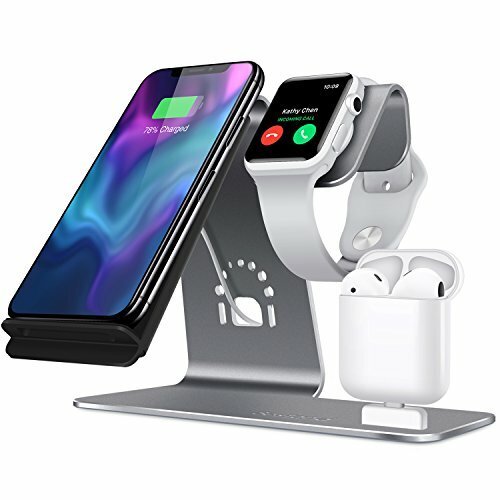 Portable Airpods charger, wirelesscharger for Qi-enabled phone(Works for iPhone with Qi wireless receiver) andApple Watch stand can be conveniently used in home or office. This charging station is compatible with iPhone 5/5S/5C/6/6 plus/6s/6splus/7/7 plus/ 8/8plus/x/(Additional Qi receiver is needed), Samsung Galaxy S7/S7edge/S8/S8 plus and other Qi-enabled cellphones. Not only cell phone, but also compatible with iPad, Apple Watch and Airpods. 3 IN 1 Qi-Charging stand in Bestand TI-mingle series. Material: Aluminum alloy material and high-quality rubber. Compatibility-It is specially designed for Qi-enabled cell phones(iPhone X/8 Plus/8/Samsung Galaxy Note 5 / Galaxy S6/S6 Edge/S6 Edge Plus/S7/S7 Edge/S8/S8 plus and so on)and Apple Watch/Airpods/iPad/iPhone 5/5S/5C/6/6 plus/6s/6s plus/7/7 plus(Additional Qi receiver is needed). NOTE: One year free warranty.